Apply for a scholarship before April 1st 2018! Did you know the Diocese of Joliet offers a transfer tuition assistance grant? As some of you know, Mrs. Yee is incubating eggs in the Science Lab. Our chickens are hatching! We now have a live stream available through our Notre Dame School Clarendon Hills Youtube channel. Check the webcam so you can see them scurry around in their tub. Thanks to NIU we had another great day of STEM activities at ND! Check out YouTube and Facebook if you missed it! Come Discover Notre Dame at our Next Open House! 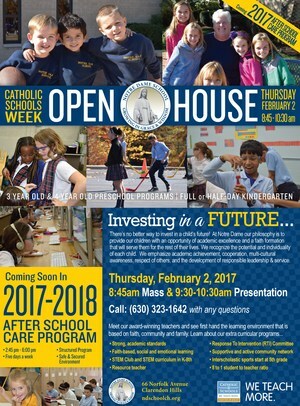 Please join us on Thursday, February 2nd for Mass and a school open house.